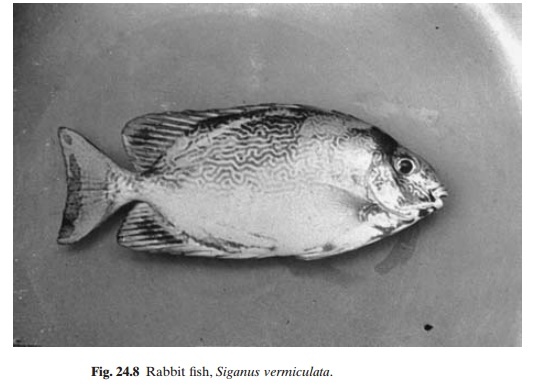 Rabbit fishes belonging to the family Siganidae (= Teuthidae) include a group of potentially important aquaculture species occurring in the Indo-Pacific, Indian Ocean, Red Sea and Eastern Mediterranean regions. Rabbit fishes belonging to the family Siganidae (= Teuthidae) include a group of potentially important aquaculture species occurring in the Indo-Pacific, Indian Ocean, Red Sea and Eastern Mediterranean regions. Though culture is presently limited to a few areas, rabbit fishes have attracted the attention of aquaculturists because of their predominantly herbivorous feeding habits, fast growth rates and high prices in the markets. They do not normally grow to lengths greater than 35 cm, but are highly relished in many areas, and for the ethnic Chinese in Southeast Asia they symbolize good fortune and are sought after during auspicious periods such as the Chinese New Year. salinity and tolerate up to 50 ppt. They are sensitive to low oxygen concentrations, below 2 ppm, and pH values above 9. Both juvenile and adult siganids are primarily herbivorous, but under captivity show omnivorous habits and will feed on a variety of foodstuffs of both vegetable and animal origin, as well as on feed pellets. In nature, benthic algae form a major part of their food, but there appear to be differences between species in the algae preferred. The long-established systems of commercial culture of siganids appear to be as subsidiary species, or in monoculture in brackish-water ponds in the Philippines or in embanked lagoons in Mauritius in combination with oysters. Experimental culture of rabbit fish in floating cages and pens, ponds and raceway systems has been attempted in a number of countries, including Malaysia, Singapore, Guam and Palau Islands, Saudi Arabia, Israel and Tanzania. However, according to reports it is only in Palau that it has resulted in pilot-scale production in cages. The main species used in culture are S. canaliculatus (= oramin), S. vermiculatus (fig. 24.8), S. rivulatus and S. luridus. Though some progress has been made in controlled spawning, all culture operations so far are based on fry collected from the wild. Juveniles are available from February to May and again from August to October or November (December in Palau). They are found usually around reef flats and are collected with push nets, scoop or dip nets, seines and cast nets. An improved mobile pyke net was found to be an efficient fry collector in seagrass beds in the Red Sea in Saudi Arabia. The spawning season appears to be from January or February to April in several areas. According to Lichatowich et al. (1984), it is likely to be April to August in the Red Sea. Siganus canaliculatus juveniles grow to adultsize in about nine months, when they mature and spawn. In captivity they may mature even earlier. Spawning is influenced by the lunar cycle and the species has been observed to spawn four to seven days after the new moon during the spawning season. The number of eggs spawned at a time is estimated to be 300 000–400 000. Siganids can be induced to spawn spontaneously in tanks and aquaria. The sudden transfer of mature fish from a tank with about 90 cm water to a shallow tank with only 18–23 cm resulted in immediate spawning of S. canaliculatus in Palau. It has been observed that thefemales release the eggs as soon as the males shed milt and fertilization takes place in the tank. Siganus rivulatus has been found to spawn in aquaria in Israel when the water is exchanged with fresh sea water. Siganuscanaliculatus and S. argenteus have beeninduced to ovulate and spermiate by injection of HCG. Larvae of S. canaliculatus have been reared to the post-metamorphosis stage, with successive feeding on mixed phytoplankton, rotifers (Brachionus), copepods (Oithona) and Artemia nauplii. Larvae of S. rivulatus and S. luridus have also been reared by similar feeding and grown to the juvenile stage. Not much information is available on polyculture of siganids, nor do accounts of recent experimental or pilot-scale grow-out contain many data on stocking rates and growth performance. In coastal ponds in the Philippines, in monoculture or polyculture with milkfish, siganids, especially S. vermiculatus, are reported to attain a marketable size of 150 g within five to seven months. Similar growth is reported also for S. canaliculatus in coastal ponds. In tank culture in Israel, fry fed with algae (Ulvasp.) and 25 per cent protein commercial fish feed pellets showed a two-fold increase in length and a ten-fold increase in weight over five weeks. Similar growth rates are reported to have been achieved with S. canaliculatus in the Philippines, where they were fed on algae, and in Palau, with commercial chicken feed pellets. Siganus rivulatus is reported to grow to aweight of 185 g in about 300 days in floating cages. Lichatowich et al. (1984b) reported a growth rate of 105 g in 150 days in floating cages, when this species was fed a mixture of soya meal (53 per cent), fish meal (14 per cent), maize (15 per cent), flour (15 per cent) and a vitamin-mineral mix (3 per cent) (from plastic trays suspended in the cages). The feeding rate was approximately 8 per cent of the biomass. Observations in Palau show that S. canaliculatus cultured in floating pens grew faster in areaswith good water circulation, and when fed with trout chow instead of with algae only. Though there is a ready market for siganids in most places, there are occasional reports of ciguatera poisoning as a result of eating them, especially in the South Pacific, and recently in Israel. The source of the ciguatoxin is believed to be marine algae such as Lyngbya majuscula, Plectonema terebrans and Schizothrix calciolla,which are eaten by the fish.